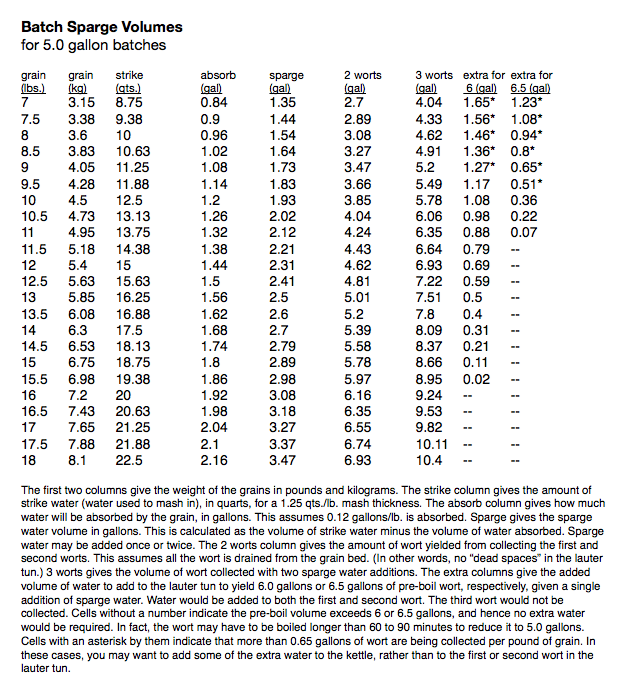 A helpful chart for batch sparger volumes using the most common mash thickness and common pre-boil volumes. Here is a table to help batch spargers plan their brewday. The table gives the amount of water required to mash in with a 1.25 qt./lb. (2.6 L/kg) mash thickness and how much sparge water would be required to rehydrate the grist to that thickness. It also gives the volumes of wort that would be collected with one or two additions of sparge water. Finally, it gives the volumes of additional water to add to collect either 6.0 gallons or 6.5 gallons of pre-boil wort when sparging once. This chart allows batch spargers to look up how much water to heat during the brewday and lets them estimate how long of a boil time to plan for. All the numbers were generated on a spreadsheet. If you are a batch sparger, you can easily make your own spreadsheet that can be altered to account for different mash thickness, different target pre-boil wort volumes, the presence of dead spaces in your lauter tun or other variables. The numbers in this chart are in English units. I’ll post the metric equivalent in the next few days. Click on table to expand. Wouldn’t it be better to have a higher water/grist ratio for batch sparging instead of adding plain water to the kettle? From my understanding you should be save as long as you stay below the .65 gallons per pound. But would staying too low under this limit loose some sugars? 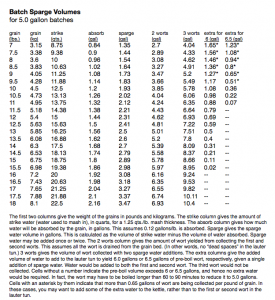 Maybe fot batch sparging you want the water/grist ratio to be more like 1.5 or even a little higher? Or am I missing something here? I agree with you, Sven. That’s exactly what I do these days. I usually use anywhere from 1.66-2 qt./lb. for mashing. It has increased my efficiency, made less work on brew day, and not had any negative effects on beer flavor. You can use whatever liquor-to-grist ratio you want, within reason. A mash thickness of 1.25 qts./lb. (2.6 L/kg) is fairly common in homebrewing(*), so I went with that. Mash thicknesses up to 2.4 qts./lb. 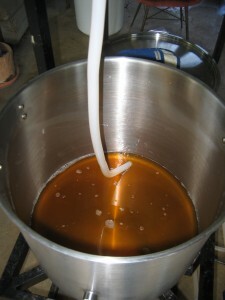 (5.0 L/kg) are used in commercial brewing. Mash thickness plays a small role in how quickly and efficiently the amylase enzymes work. The more dilute the mash, the longer distances enzymes have to travel before contacting their substrate (starch). (Also, they’re less stable in more dilute mashes, IIRC.) However, given that most homebrewers mash for 60 minutes, the enzymes have plenty of time to do their thing and any reasonable mash thickness should work. This goes double if you are using US base malts, which typically have very high DP (diastatic power). So basically, pick whatever mash thickness works best for you given your setup and your preferred procedures. (*) For example, this site — http://hbd.org/cascade/dennybrew/ – recommends mash thicknesses of 1 to 1.3 qts./lb. I will third Sven’s suggestion. It seems that BIAB brewing has clearly demonstrated that a wide range of water to grist ratios are viable.